a small parenthesis about this score. JoAnn Kane had posted at facebook long ago a few bars from the original main title. As you can see the music is very different from what we know, but I guess unfortunately it wasn't recorded. It was not recorded. According to the recording log, they were prepared to record a take of this on January 16, 1978, the first day of recording. It's written on the log but scribbled out and they instead went on to record, "Gillian's Escape". That was the last cue recorded on the 16. On January 18, they recorded "R1-P1 Main Title (Cut Version of End Credits)" and that's what was used in the film (take 95, if you're really interested). For reference, the "End Cast" (R12-P3) was the second cue recorded for the picture on January 16, 1978.
you *need* to get Jane Eyre, my personal favorite Williams score from the same fertile time period of the 70s. That's an interesting way of putting it, since (in my own experience) the two movies belong to very different periods. The wonderful JANE EYRE seemed to come out of nowhere -- the television work of promising but relatively obscure young composer. Whereas THE FURY was the first ordinary-size movie to follow Williams's intergalactic explosion to fame in 1977. To my mind THE FURY was the movie that confirmed Williams as a complete master of film scoring. I'm looking forward to this release, since I've made do with the LP for all these years. I finally recouped another copy of this La La Land miracle...this score is right up there with Superman as my favorite by Williams, what a triumph and an influence on my 4th symphony. It's very cool that JW was pointed toward a Herrmannesque mindset, however I think John really took the ball and ran with it here. THE FURY is one of Williams' best in my opinion. I remember hearing that director Brian De Palma asked Williams to evoke Bernard Herrmann. Does anyone know if this is true? The score certainly does have some Herrmannesque passages. As I recall, Williams decision to "do" Bernard Herrmann, musically speaking, was his OWN idea and De Palma, a longtime Hitchcock devotee, totally agreed with Williams approach. After all, Williams has paid tribute to "Bennie" before in STAR WARS, RETURN OF THE JEDI and TEMPLE OF DOOM, both directly AND indirectly. And like NORTH BY NORTHWEST before it, THE FURY has a mix that concentrates most heavily on the "midrange". For the record, I prefer the OMPS recording of THE FURY over the RR by the LSO of same. And WHY was the LSO re-recording of the soundtrack even done? I thought that Hollywood wanted to save as much money as possible when producing movies. 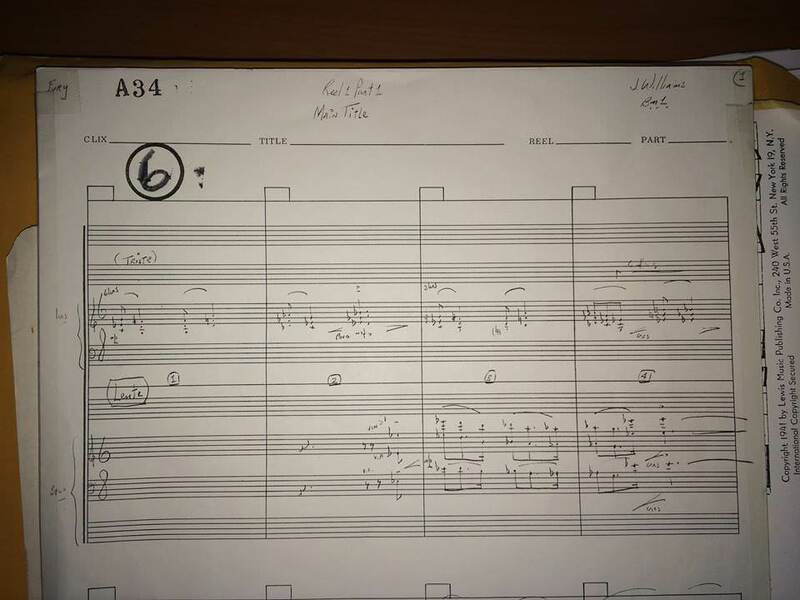 I believe Williams had some extra time at the end of his Superman sessions with the LSO, and wanted to record a more "concertized" version of the score for an LP presentation. John Williams did his usual thing. Like he did with The Towering Inferno, Jaws, And On And On. It was no doubt cheaper to make a new recording in England than it was to release the original tracks. This wasn't too unusual; a lot of albums of film scores used to be different recordings (often with reduced orchestras) due to the prohibitive re-use fees of using the film recordings. Yes, a prime Williams score, with a towering performance from the London Symphony Orchestra on the album. A real fan would have the two Varese releases plus the La-La Land version. Give the Matessino/La-La Land nexus great credit for extracting more detail out of the material. Finest combination of the Herrmann-esque Williams and the operatic style that Williams was perfecting at that time. The LLL release blows the Varese disc out of the water, especially the original film tracks. Oh, I'm sure it sounds good.